I've almost got my 73 coupe re wired. This picture is from the driver's side firewall. The white/purple and black/pink wires have been cut. I don't know what they do. Back up lights? The real question is the wire with the white female bullet connector. Is this wire brown? Could this be where my shifter light plugs in? Thanks. That's the PRNDL shifter lamp lead. The white/purple stripe wire is the power feed for the backup lights. The black/purple stripe wire runs from the backup light switch to the backup lights. You can go to the Mustang Data tab at the upper right corner of this page and download the electrical schematics. 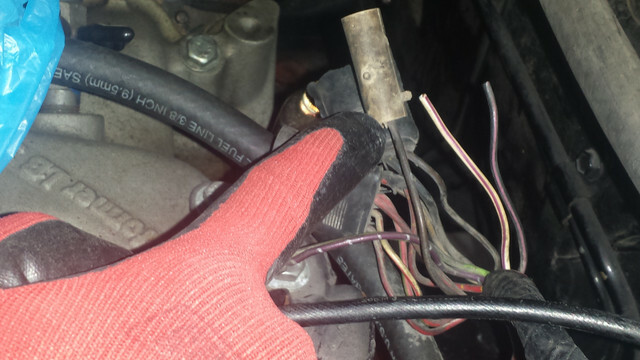 (04-15-2019, 08:45 PM)Don C Wrote: The white/purple stripe wire is the power feed for the backup lights. The black/purple stripe wire runs from the backup light switch to the backup lights. Thank you both. I have various wiring diagrams, but I struggle with where the actual connectors are located. My PRNDL cable is zip tied to the bottom of my car. I was hoping the white connector was where is plugged in. Any clue how the cable is actually run? Does it just snake up to the engine bay from under the car? Thanks again.